New York Times columnist Nicholas Kristof believes in the power of education. From early childhood through adulthood, few other institutions hold the power to transform lives so completely. 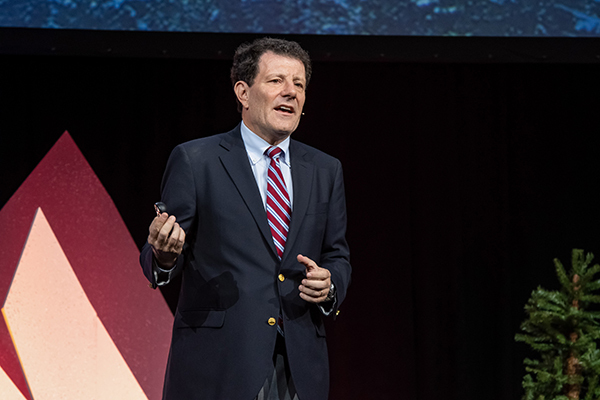 Yet as the gap between the haves and have-nots grows wider in America, more and more families struggle to tap into those benefits, Kristof told attendees Friday during the keynote address at NACAC’s 74th National Conference in Salt Lake City. The divide is especially concerning given the challenges faced by our country, Kristof said. Wages for the working class have been essentially stagnant since 1970. And for the first time in half a century, life expectancy has fallen for two years in a row. Access to higher education could help address those issues, yet a large chunk of the American population remains locked out. Kristof’s next book will take a close look at who’s being left behind in the new economy. For the project — which will be co-written with his wife, Sheryl WuDunn — Kristof is chronicling the life experiences of classmates and neighbors in his hometown of Yamhill, Oregon. The book will touch on the human cost of poverty. He estimates that about a quarter of the people he rode the school bus with as a student in the 1970s have already passed away from drugs, alcohol, suicide, accidents, or obesity-related illnesses — patterns he says are in danger of repeating themselves among the next generation of students. Counselors and college admission professionals have an important role to play in helping to combat those issues, Kristof said. Read a Q&A with Kristof in the most recent edition of NACAC’s Journal of College Admission.